Imagine you just acquired a dilapidated old house on 5 acres of prime property. Let’s say that it was an inheritance from an unknown rich relative. She heard what a wonderful person you are through the family grapevine, and wanted to leave you something. Can only use the money for the renovations and restoration. Take a few minutes, and let your mind construct a dream house within the constraints provided. To make it more of a challenge, imagine that the original structure is of a style that is the complete opposite of your own tastes. As your mind begins to construct a beautiful dream house within the limits given, it kicks in to what I call Creative Adaptation Mode. It’s something we all have, and is a great way to prove that we are all creative — regardless of what you might think. As a student of the creative process, and a former creativity coach, I found this to be the most intriguing form of creativity. It’s the “creating something from something else” form of creativity, as opposed to the “creating something from nothing” form. (I should note that there is some debate as to whether the second form even exists, since almost everything is created based on something else, even if it’s only loosely based). In this series I’ll look at how these work together, and how creative adaptation is used in a variety of ways. It’s one of the key tools in the entrepreneur’s toolbox, and can help you make your own ventures more diverse and successful. 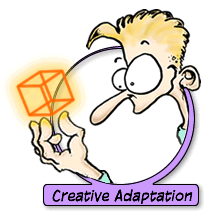 In part two we’ll begin by taking a look at the inspiration that creative adaptation provides.